St Just-in-Roseland, is located accross the River fal from Falmouth and it is is a small quiet village (smaller than the other St Just-in-Penwith). 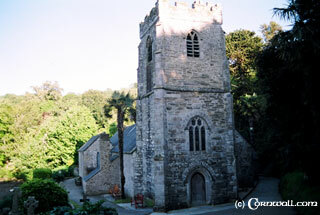 St Just-in-Roseland is well known for its beautiful 13th Century Church with sub tropical gardens on the bank of the River Fal. The plants are exotic and there are quiet channels of water running through the Church garden that give it a fantastic spiritual atmosphere, even to people who might not normally be drawn to churches. There is certainly no other Church garden like it in Cornwall if not the country as a whole.